What prompted this new change was a new Bachmann release of the Knapford Station. In reality, it really isn't the station but the glass canopies and platforms. There are problems with the design, but not something I can't work around and it should be recognizable for what it is. The design is based on a pretty typical folded dog-bone. 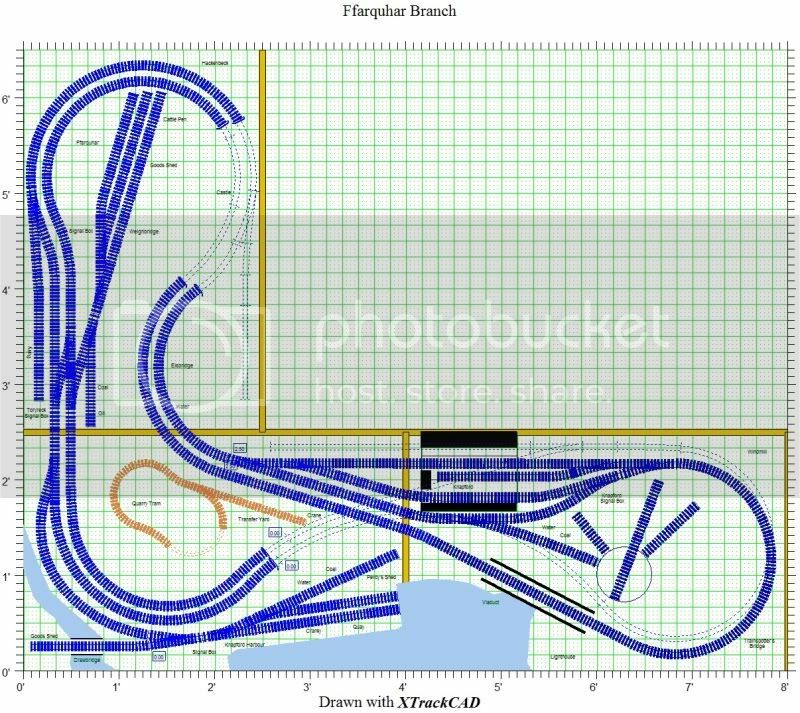 It gives the appearance of a double mainline, though it is really a long single line - but long enough that I could easily run two trains chasing each other around the layout. Probably the biggest change is rotating the right most module 90 degrees and opening up the operating pit. The next important change was to reduce the shunting options. This layout is meant for shows and meant for young children. I don't want to get involved with shunting - I want to run trains and visit with the public. I have some storage tracks for wagons at Ffarquhar and at Knapford Harbour - and a small engine yard at Knapford. 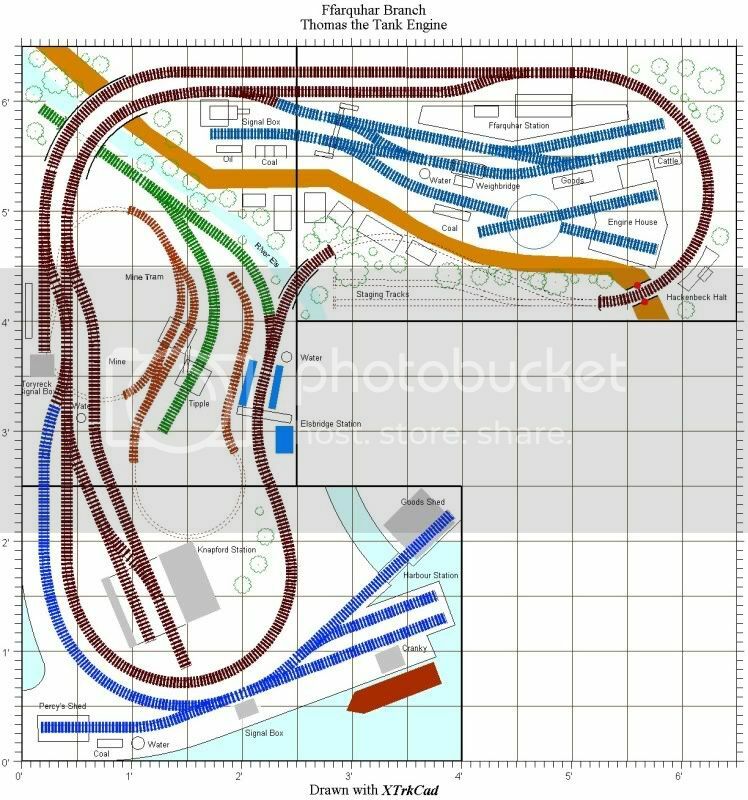 And finally, the change that prompted all of this, is the run-through tracks at Knapford (as opposed to the stub-end in the old layout). This makes it all much easier to run and much more recognizable. I do not intend to start on this change until after the New Year - but I am excited to get going. I welcome and questions or suggestions. Well the permanent way gang will have a lot to do in the near future! Just can't understand which will be the wiewing side! Operating will be on the inside with viewing from the left and bottom, and little around each side. I plan to put up acrylic sheets on the viewing sides since kids like to look with their fingers. By the way, one of the things I like about this arrangement is the backscenes - at least behind Knapford Station - I'll be able to use the same backscene they used on the TV show - a brick retaining wall with the tops of the city buildings behind it. The other side will have a mountain with a castle on top. Both back sides will have a single hidden staging track - which will make it easy to set up and remove trains. Open question to anyone that has built a quay - How far above the water should a quay with track be? I realize that in the real world that distance would vary with the tide. And I also know that it should be the appropriate height for loading off and on a ship - but I don't have a ship yet, so I can't take the measurement. So I guess, if there isn't a standard distance, perhaps a survey of what you all have done would be appropriate. recent photo of preserved Car Barge in NYC harbor. You can guess how far it is down to the rusty marks. Beside tide variations, you should consider what type of "floater" will dock at your quay too. Many of the smaller harbours around England have to be locked in. Judging by your plan you could quite comfortably fit in a 150ft freighter, which is pretty big for the Rev Awdry's era. Or a couple of schooners. Assuming a lock then your quay needn't be higher than 10ft. By the by, the last trading schooner under the Red Ensign was the Nellie Bywater, which was lost off Bolt Head in 1951. Thanks, John - that helps a lot. By the way, what is "locked in"? Locked in is where the ship has to pass through a single lock gate to enter the port. They're not just for canals.